Pat has been in the financial services industry since 1977. He started out working as a Life Underwriter at New England Life. 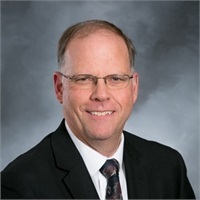 He was the president of CLU ChFC Cedar Rapids Chapter from 1992-93 and served as moderator of personal and business life underwriter training council. Pat also served on the board of the Cedar Rapids Life Underwriters. Pat focuses on personal insurance planning, retirement planning, business planning and estate insurance planning. He has served in the community as past president of the Cedar Rapids Optimist Club. He is a board member of the Memorial Salute of Flags and a past board member of the LaSalle Alumni. He is currently a member of St. Elizabeth Ann Seaton. Pat is a graduate of the University of Iowa where in 1977 he received a Bachelors Degree in Insurance and Marketing. He has been married to his wife Kathy and they have 3 daughters, with families of their own.